When you make one step on the belt stops or feels sticky. Remove the engine cover and see if the slip depends on walking belt or motor belt. If it's the walking belt, adjust the tightening screws according to the instructions on our blog to avoid overtightening. If it is the motor belt, adjust the screws or nuts regulation according to the instructions on our blog to avoid overtightening. If the treadmill during use stops or the thermal protection skips. Check the status of the platform in its central part, ensure that it is not worn or damaged. Check also the lubrication. Check the status of the belt. Remember that running belts lasts from 3 to 4 years for home use and do not exceed 2 years in case of intensive use (gyms). Check the tips on our blog. Solution: change the walking belt. If the treadmill doesn’t start. Solution: check all plugs, sockets and wiring. Check the fuses (they are intact and not burned). You hear a noise like pat (tac-tac) from front or rear roller. The LCD does not read the numbers or appear in half. Make sure the batteries are in good condition. 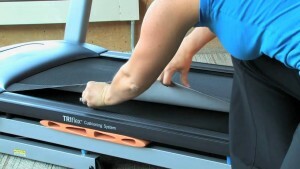 How to conserve your treadmill?